The story of the feast goes back to the following legend: The capital city of Byzantium was being threatened by foreign invaders. In fear they invoked the intercession of the Holy Virgin Mary (also called Theotokos, which means Mother of God) at the Church at Blachernae. The people prayed throughout an all-night vigil. During the night, as they prayed, Saint Andrew and his holy disciple Epiphanius saw a vision of the Mother of God entering the main doors of the church. She proceeded to walk toward the holy altar where she knelt down and remained there a while in solemn prayer. 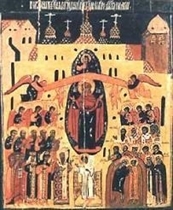 Then she arose, removed her veil (“pokrov”) and held it up, stretching it out wide over the people as if to protect them. After that she disappeared. St Andrew and St Epiphanius interpreted the vision as a sign of God's intervention among His people. Soon thereafter, the enemy invaders retreated. Thus the city was saved. This event has been celebrated ever since each year on October 1, and is known in church-Slavonic as: "Pokrov Presvjatoji Bogorodjtsi" (meaning "Protection of the Most Holy God Mother").